Here are the dates and details of the coming Southern Winter league F3f competitions. 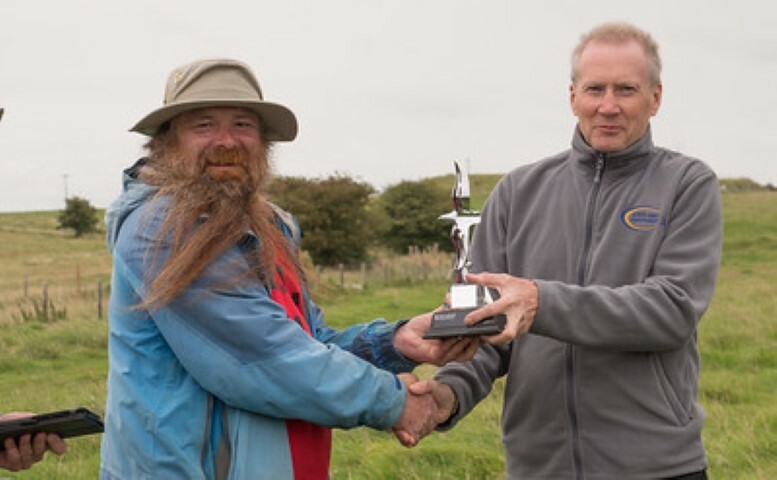 Hopefully the weather will be much kinder to us than last year when only 2 comps were staged, one of these being at Whitesheet the other at The Long Man, Eastbourne. The venues for the coming competitions are Whitesheet, Butser Hill & Eastbourne. The chosen venue for each competition being dependant upon the forecast wind direction. A ‘venue & weather call’ will be made on the Friday evening before each competition, note ;- earlier if the various forecast allow. This decision will be announced / posted on the Whitesheet RFC website, the BARCS forum Southern Winter league thread, & via an email to all WRFC members. The Regional winter lg comps are the perfect introduction to this very exciting branch of our sport. Newcomers are encouraged to come along and try F3f for perhaps their first time, always being guaranteed a very warm welcome. Hints, tips & advice on model set up & flying the course are always freely given. Most sports models are perfectly suitable to use, you don’t need an expensive F3f mouldie. It is through these comps that most of us regular F3f pilots ourselves started. Thank you very much for your understanding & co-operation regarding this. Sunday Dec 9th. – 1 & 2 reserve – Date not required. Sunday, Dec 23rd. Round 3 – Cancelled. Sunday Jan 27th. Round 4 – Competition staged at Whitesheet. Sunday Mar 10th. Reserve – Comp cancelled on day 68 mph Winds ! Round 5 reserve comp report . Yikes ! 68mph W-WNW. Andy B & I walked out in advance of everyone, to the very far end of what is known as ‘Morgans’ . Whilst I set about marking / measuring out the course Andy had a fly to test the conditions. Within 5 minutes of him launching the wind had picked up significantly, this I recorded as 50- gusting to 55 mph . Credit to Andy, he stuck with it for several more minutes in what would best be described as being a bit of ‘challenging air’ lol. While taking a further windmeter reading it had now averaged a steady 55 – 60, with a highest measured gust of 68 mph THUD ! With the wind still picking up, Andy then brought his model around to score a perfect 10 landing . The result……….a round of applause to Andy B & Comp cancelled . Windswept Stu. Whitesheet Comp Sec. Finally, at the fourth time of asking we have finally got Southern Winter league underway . The various weather forecasts all proved pretty accurate. The day was in fact brighter than had been forecast with us having long periods of blue sky & sunshine. No rain whatsoever. The forecast strong / very strong North westerly was with us throughout the day. For the first few rounds of the morning this averaged 20-25 mph, this increased to to 25-30 during the middle of the day rounds, increasing further to average 35-40 for the last 3 rounds. The max strength that I recorded during the day was in round 9 this topping out at 48mph . We had a very good entry of 18 pilots, very encouragingly amongst these being a number of new / fairly new pilots to F3f & some pilots who have recently returned to racing after lengthy breaks. A perfect mixture therefore & exactly what the Winter league comps were designed for. Racing conditions such as they were yesterday are very few & far between, I was therefore particularly impressed by the skills of those new / newish pilots to F3f. I’m looking forward to enjoying future competitions with these pilots & seeing them progress in this very exciting branch of our sport. Here is a brief round by round summary of how the final top 5 positions unfolded . Round 1. Greg Lewis had the honour of getting the comp underway, Greg promptly posted a time of 38.98. Next up to fly was Nigel Witchalls. Nigel fell short of Gregs time by the very narrowest of margins posting a 39.00. Graeme Mahoney went even quicker posting a 36.75, this was to win the opening round. Clayton Landells posted a time of 40.26 to finish 4th. Mike Evans took 5th with a 41.83. Round 2. Greg Lewis again set the target to beet posting a 38.78. In this round Nigel Whitchalls turned the table on Greg by posting a 38.20. Clayton Landells was to go even quicker posting a superb 35.95 to win the round. Andy Burgoyne took 4th with a 39.12. Mark Passingham was 5th with a 40.34. Round 3. Nigel Whitchalls set what was to be the target to beet in this round, this being a 45.08. With the following 9 pilots posting mostly mid 40’s -mid 50’s Dave Woods then looked to be going to win the round by posting a 41.43. However Mike Evans was to push Dave into 2nd by posting a 40.76 to win the round. Mark Passingham posted a 45.65 to finish 4th. Greg Lewis was 3rd with a 46.22. Round 4. Greg Lewis opened this round with a 38.59 this was to secure him 3rd place in this round. Graeme Mahoney flew a 40.74 to take the 2nd place position. Clayton Landells again showed everyone he was on top form by posting a 37.81this was to win ‘Skip’ the round. Dave Woods finished in 4th place with a 43.17. Ian Falconer took the 5th place position with a 44.71. Round 5. Mark Passingham had an excellent rd 5 posting a time of 37.71, this was to win him the round. This too was to be a good round for Ian Falconer finishing 2nd with a time of 39.03. Mike Evans was back into the top 3 after posting a 39.54 to take the 3rd place. Graeme Mahoney finished this round in 4th after posting a 42.28. Greg Lewis was 5th with a 42.57. Round 6. Greg Lewis posted what was his 4th sub 40 of the day this being a 39.61. This was to give Greg a 3rd place in this round. Mike Evans took 2nd place with a 39.26. Clayton Landells posted his third sub 40 of the comp with a ‘Cracking’ 36.03. Andy Burgoyne finished in 4th with a 42.10. Mark Passingham took 5th with a 42.34. Round 7. Greg Lewis opened the round with a 40.25, this was to win him this round. Nigel Whitchalls posted a 40.82 to give him 2nd place. Andy Burgoyne secured himself a top 3 placing by posting a 40.87. Dave Woods finished in 4th with a 43.69. Mike Evans was 5th with a 44.58. Round 8. With a new hill record having already been set by both Greg & Clayton, Greg pushed this time even lower with a ‘Blistering’ 33.85. Graeme Mahoney posted a 38.12 to give him third place in this round. David woods secured himself his second 2nd placing of the comp with a 37.93. Mike Evans finished in 4th place with a 38.28. Mark Passingham was 5th with a 39.47. Round 9. Greg Lewis opened with a 43.69, this was give him 2nd place, David woods finished 3rd with a 44.01. Clayton Landells equalled Gregs tally of 4 sub 40’s on the day by posting a ‘Cracking’ 35.89 , this was to win him this round. Mike Evans finished in 4th with a 44.36. Nigel Whitchalls was 5th with a 46.95. Round 10. Dave woods achieved another second place by posting a 37.55. Mike Evans took 3rd place with a 43.17. The final flight of the day was by Clayton Landells, this was another excellent round by ‘Skip’ posting what was to be the second fastest time of the day a 34.54. Nigel Whitchalls took 4th with a 43.52. Andy Burgoyne was 5th with a 44.94. With the racing having been so close, nobody could confidently call who had won the comp or the order of the top 5 placings. It was down to the computer to reveal all. 5th. Nigel Whitchalls 914.7 Pitbull. Fastest time & new hill record by Greg Lewis 33.85 in rd 8. 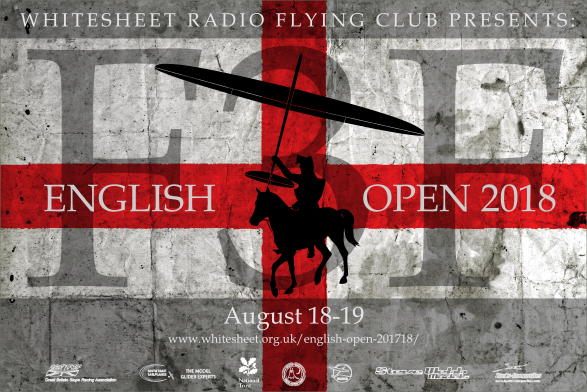 The English Open F3f 2019 Aug 17-18th 2019. Details of this competition will be posted here shortly. BMFA F3f lg 4 Sunday 29th September 2019. Day 1;- The morning dawned with a very light drizzle in the air, this however quickly cleared enabling racing to get underway only minutes behind schedule. Eight rounds were flown during the day on our SW bowl. 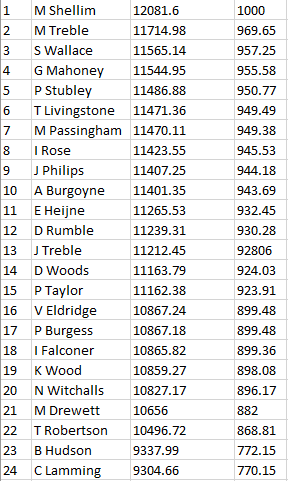 Round winners were John Treble, Paul Stubley (2 rds) Mike Shellim(2 rds) Dave Rumble, Nigel Witchalls, Andy Burgoyne. At the end of day one in 1st pace was Paul Stubley, in 2nd place Mike Shellim and in 3rd place was John Treble. Day 2;- Another full day of racing with 7 further rounds being flown. A shift in wind direction required a planned for & quickly made course move at around lunchtime. Round winners were Mike Shellim (2 rds) Graeme Mahoney (2 rds) John Philips, Mark Passingham, & Myself Stuart Wallace. The result;- Consistently accurate flying throughout the competition by Mike Shellim flying his Striborg secured him a well deserved win. Second place went to Mark Treble flying his trusty Toxic. Third place went to myself Stuart Wallace, I flew my Pitbull on day 1 switching to my Radical on day 2. Fastest time was John Phillips flying a Redshift, with 39.22 seconds. Since the events reintroduction back into being by the Whitesheet RFC in 2014, owner Peter’s sponsorship of this event has been truly excellent. 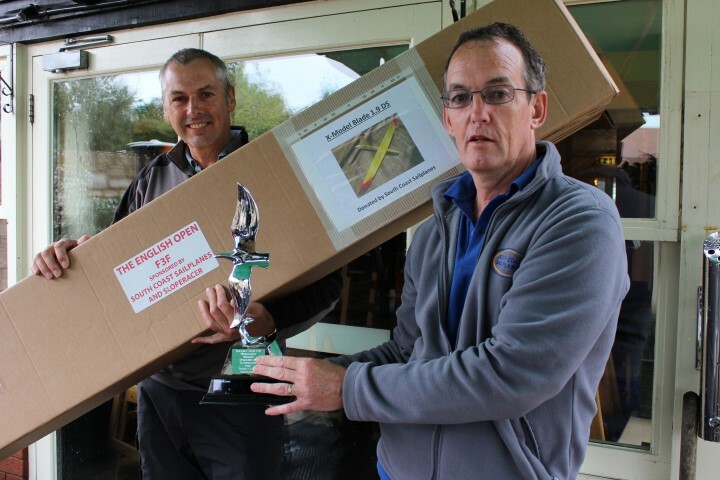 In addition to sponsoring the events stunning ‘free flying Eagle’ trophies, Peter has very generously donated ‘cracking’ prizes to the winners. 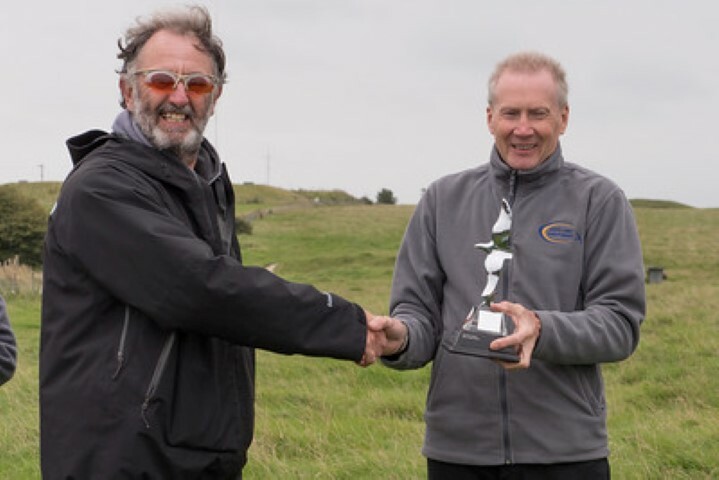 This year Peter presented winner Mike Shellim with an X models 1.5 E http://www.south-coast-sailplanes.com/x-model-blade-1-5-e-glider . I’m certain Mikes going to have a lot of fun with this. Peter arrived at around midday on day 2, spending the afternoon watching the final few rounds & chatting with all the pilots prior to his presenting of the trophies. 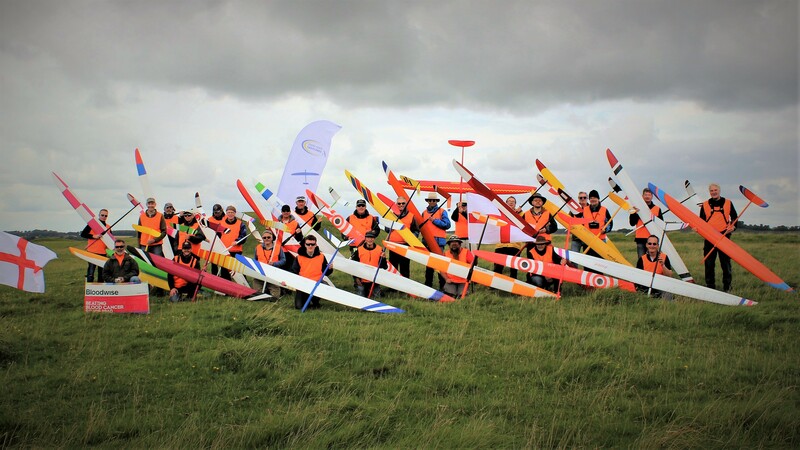 Peter is the UK’s distributor of the excellent X models range of gliders. Models include Blade’s ,Swords, Swifts , Stingrays, Prismaray, Graecalis, Primarays & more, Pete has them all. On behalf of the Whitesheet RFC & all the pilots who have entered this competition since 2014, thank you so much Peter for your very highly valued ‘Cracking’ sponsorship . Thankyou to all who supported the Charity raffle in aid of both Boodwise, & Histio UK. The total raised was an excellent sum of £260.00. The raffle was staged in memory of my Son Tom (aged 26), who died from both blood cancer, & a rare blood / immune system disorder in Nov 2015 .
Who are Bloodwise, & Histio UK ? ;- Bloodwise are the UK’s blood cancer charity, they fund world class research into blood cancer. Additionally, they provide emotional & practical support to patients & their loved ones & raise awareness of blood cancer. They are there for everyone effected by blood cancer, whether its Lymphoma, Leukemia, Myloma or other blood disorder. The raffle prizes ;- The following is a list of those who very generously & kindly donated prizes. Sponsor Peter Payne of South Coast Sailplanes & partner Debbie Utteridge donated two ‘Cracking’ prizes of accommodation at their Guest house ‘The Rosscourt’ in Bournemouth . https://therosscourtbedandbreakfast.co.uk/ .The prizes being a 1 night stay for 2 persons, & a 2 night stay for 2 persons. Steve Webb models / servo shop https://www.stevewebb.co.uk/ https://www.servoshop.co.uk / donated a £25.00 gift voucher redeemable in store. Graeme Buckingham https://www.bucks-composites.com/ donated a £25.00 gift voucher for his store. The Great Britain Slope Racing Association (GBSRA ) http://www.gbsra.co.uk/ donated membership to the GBSRA. 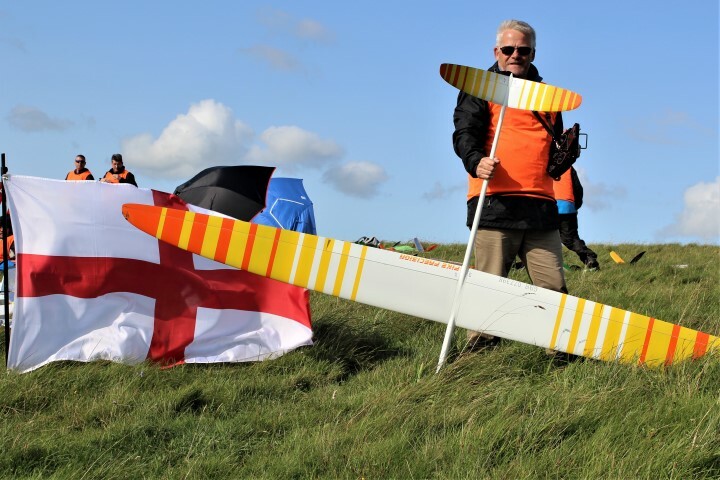 The Whitesheet RFC donated the ‘cracking’ prize of an Ahi aerobatic glider , details of this model are here ;- https://dream-flight.com/products/ahi-kit . The Ahi continues to receive rave reviews across the world, it needs no introduction or words from myself. The English Open F3f 2017 . Winner John Philips. 2nd Tony Livingstone. 3rd Mark Treble. Team Winners ;- Tea Swillers. pilots ;- John Philips, Erik Heijne, Mark Passingham. Above. 2017 Pilot Group Photo. (Below) Winner John Philips was on top form throughout the 2 days of the competition. 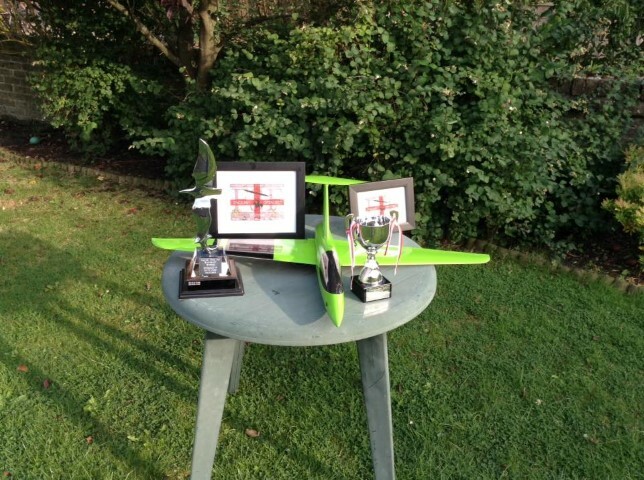 Above ;- JP’s ‘Cracking’ haul of prizes;- English Open ‘Free Flying Eagle’ winners trophie, 1st prize of an X Models ‘Pushy cat’. both sponsored & donated by South Coast Sailplanes owner Peter Payne. Mike has very kindly given me his permission to include a link to his excellent Rc Soar.com website. Mike has competed in all English Open competitions, he has written his own reports & taken a ‘cracking’ set of photo’s at each event. These are viewable by following the links. Sadly, the event was not staged during this year. . Winner Mike Evans. 2nd Graeme Mahoney. 3rd Martin Drewett. Team Winners ‘Gifcof’. Pilots Graeme Mahoney, Tony Livingstone. 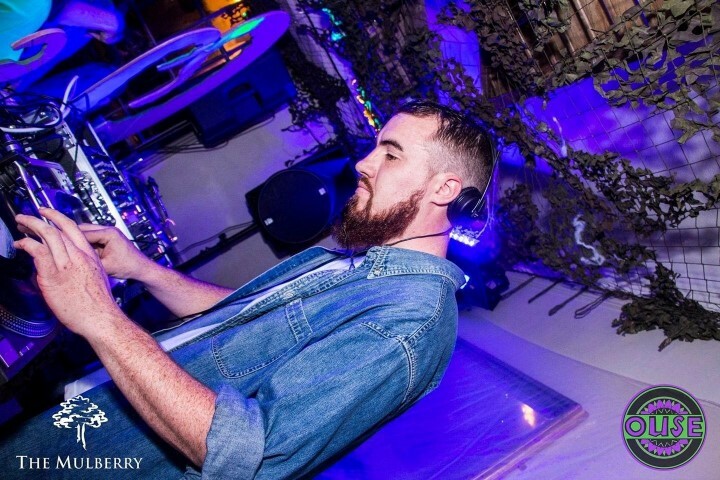 Martin Drewett. 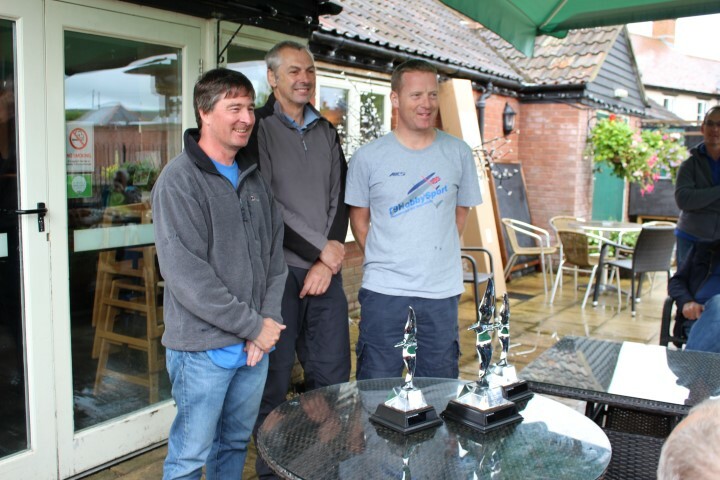 Above, left to right ;- Runner up Graeme Mahoney, Winner Mike Evans, 3rd Martin Drewett. 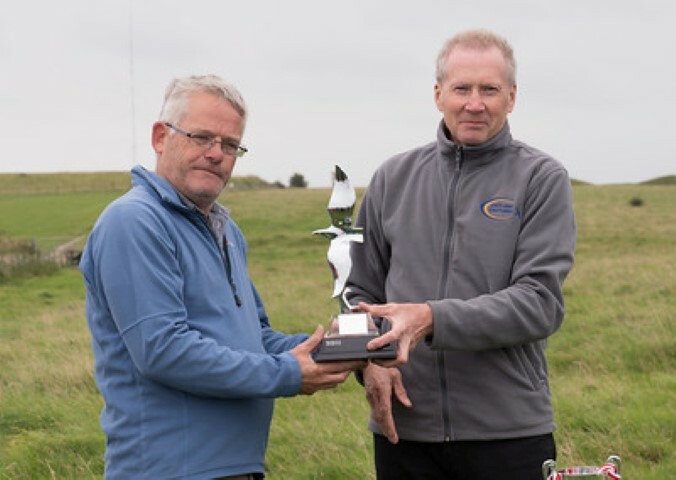 Sponsor, South Coast owner Peter Payne was sadly unable to attend, I therefore presented Mike with the English Open winners trophie, & the ‘Cracking’ first prize donated by Peter of an X models 1.9 DS. Winner Mike Evans, 2nd Mark Treble, 3rd Tony Livingstone. 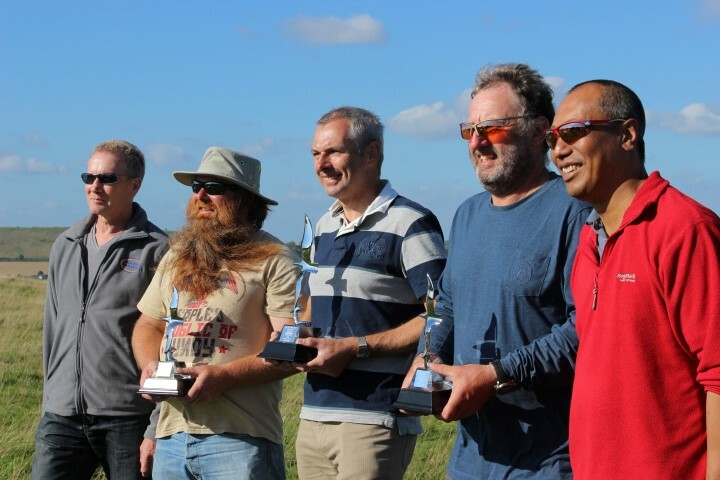 Above left to right, South Coast Sailplanes owner Peter Payne, 2nd place Mark Treble, Winner Mike Evans, 3rd Tony Livingstone, Sloperacer owner Tony Fu. Winner Mark Redsell, 2nd Keith Wood, 3rd Graham Reed. Winner Kevin Newton, 2nd John Philips, 3rd John Bennet. Winner Mike Shellim, 2nd John Bennet, 3rd John Philips. Winner Mike Evans, 2nd Mark Southall, 3rd John Bennet. Winner, Kevin Newton, 2nd Simon Hall, 3rd John McCurdy. Winner Ken Woodhouse, 2nd Andy Ellison, 3rd, Johb McCurdy. 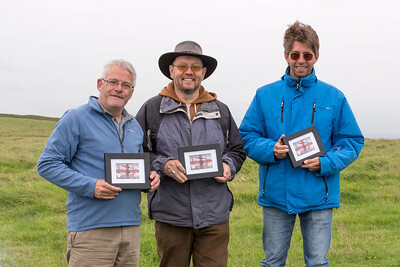 I plan to add more information & photos for each year creating a history of the English Open F3f event. Be sure to visit again soon.